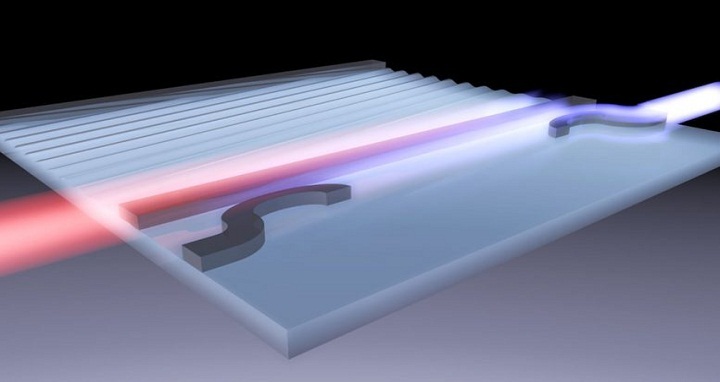 Dhaka, 19 September, Abnews: Yale scientists have demonstrated a new method to control the behavior of light on a silicon chip — specifically, its direction — by using sound waves. This discovery appears Sept. 17 in the journal Nature Photonics. In most materials, light behaves the same whether it is traveling forward or backward. Existing approaches to produce commercial benchtop optical isolators typically involve synthetic garnet crystals interfaced with permanent magnets. However, when building on-chip devices, neither exotic crystals nor magnetic fields are readily available. As a result, alternate proposals have sought to use electrical or acoustic control of chip-based optical circuits to demonstrate non-reciprocal light propagation. Thus far, these promising approaches have been hindered by problems such as excess loss of light signal or working only for light that is a single color. By coupling light and sound on a silicon chip, Rakich’s team demonstrated that traveling ultrasound waves can produce non-reciprocal propagation for light over wavelength ranges 100 times greater than previously observed, and with practically no excess loss of the light signal. The same system has another benefit: The sound waves themselves were created using light, allowing the researchers to control the shape and direction of the ultrasound emission at will. This extra “knob” allows the same device to operate on light signals of practically any color, according to the researchers. “Beyond the practical uses, it’s an example of very interesting and non-intuitive physics — seeing these different parts come together is very elegant,” Kittlaus said. Additional co-authors from the Yale Department of Applied Physics include graduate students Prashanta Kharel and Shai Gertler.